Leg pain muscle testing can be done by yourself at home. When a nerve is seriously injured, the muscles supplied by the motor portion of that nerve will first start to hurt a lot; the pain can be extreme. Then little twitches called fasciculations will begin in the muscle, and then it becomes weak. Finally, the muscle will start to atrophy, lose muscle bulk, and the whole leg will appear thinner to the careful observer; it's wasting. Weakness signifies what is known as a hard neurological sign. One that can be measured, as compared to pain and tingling which are more difficult to quantify. It goes hand in hand with loss of the reflex associated with that nerve root. Primarily the achilles tendon, and quadriceps tendon reflexes. It's not difficult for you to test the major muscles associated with the sciatic and femoral nerves. Just follow this link to Youtube, find yourself a kitchen chair, and in two minutes you'll know whether you have weakness, paresis, in medical jargon, or not. That motor nerve is most commonly affected by a slipped disk that has bulged into the inter vertebral foramen where there very little space. The bulging disc traps the nerve root, known variously as a prolapsed or extruded slipped disk, and causing severe leg pain. In a grade 4 prolapse there may be minimal back pain. Sciatica is the name of the condition in the lower back causing pain in the leg; weakness in the foot is not uncommon. Leg pain muscle testing will give some idea of how far the condition is progressing your leg; can you raise your big toe? One of the signs on a scan is that the fat around the root which appears normally white has been squeezed out. Read about it at the femoral nerve damage page below. Knowing exactly which movement is weak helps your chiropractor know where the problem is; hence the importance of leg pain muscle testing. The calf muscle or gastrocnemius and soleus enables you to raise your heel off the ground and stand on your toes. Extensor hallucis longus lies on the side of the lower leg; can you lift your big toe off the ground? The quadriceps straightens the knee. Is it giving on the stairs? The first two are driven by the sciatic nerve, and the third, the quadriceps, by the femoral. The former emerges from the lower spine, and the latter from the mid to upper lumbars. Or your chiropractor will use more tests to decide exactly where the nerve root is being pinched. For example, reflexes will help; knowing precisely where any numbness in the leg occurs is important too. Then finding any particularly tender spots in the spine may yield more information, though this can be quite misleading. Joint fixation tests are very important, though even they can be a distraction; severe prolapses often leave no obvious blocked vertebrae on motion palpation. Xrays unfortunately can be very misleading too. In a recent femoral nerve damage case, they showed old injury above and below the actually extruded disc which looked perfect on plain film. If one went by the radiographs, the wrong area would be treated. An MRI is the diagnostic tool of choice and really should be available in every case where there are signs of leg pain and muscle wasting. Sadly it's a very expensive test and not routinely done. If you have the money and you have leg pain with strongly positive nerve stretch tests, and muscle weakness, don't hesitate; get a scan. Your chiropractor is faced with a dilemma. You see, once muscle wasting and weakness is evident, it's considered by medicine to be a surgical emergency. 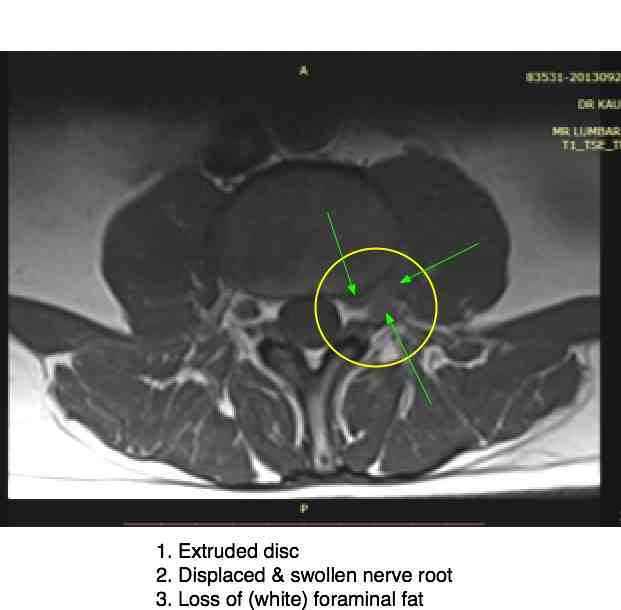 If your chiropractor sends you to a specialist for authorization of an MRI, and the expected extruded disc is found, there are immediately two big negatives. the surgeon will immediately try to convince you that it can only be treated by surgery, and spinal manipulation cannot possibly help. Not so, I have treated many extruded discs successfully, and had one myself that was successfully treated. your chiropractor loses his patient. On both counts, your chiropractor is reluctant to send you for a scan unless you can pay for it yourself. It's a nasty catch 22 situation. Leg pain muscle testing by following the link to YouTube and in two minutes you'll know how serious it is. How reliable are X-rays ..? A slipped disk generally causes pain on forward flexion but what may confuse the inexperienced clinician is that when the nerve is trapped in the foramen by an extruded disc, extension of the spine causes the nerve root to be neatly trapped by the pincer affect of the facet joints: immediate severe leg pain on bending backwards. If you are standing in a strange, twisted posture, known as an "antalgia" then do take the seriousness of your condition into account. You are on the verge of extremely painful leg pain. One last tidbit: whereas pain in the leg, and sensory change, can change dramatically after one treatment, a wasted muscle can take several months to return to normal. Don't rush off to the convincing surgeon's invitation because the muscle is not restored in a matter of weeks. Let pain be your guide: if the pain goes, and the stretch tests return to normal, then the muscle strength will return. You can do the stretch test for the sciatic nerve yourself at home, but the test for the femoral nerve is much more difficult. This is the scan of my own back showing severely entrapped femoral nerve root after a stupidity. Excellent treatment by my chiropractor saved me from the expected surgery. Yes, doctors too often may need skillfully done adjustments of the spine. Your chiropractor will be doing leg pain muscle testing if you have severe pain radiating down the lower limb. If not, my advice is that you go elsewhere. The saying is, if you don't look for it, you won't find it. And so it is; muscle weakness, especially in the early stages doesn't jump out and report itself to the hasty examiner. It's well known that anecdotes have little or no value. For example, if you neighbour tells you that taking vitamin C cured her cystitis, it really has dubious value. Likewise, the case files you'll find at chiropractic help have no scientific merit. But, could your neighbour's remark be true? Yes, it certainly could; if you're sure the advice offered could not hurt, and she's not peddling vitamins as a sideline, then you might give it a try. Likewise files likes this L4 lumbar spine casefile tell an interesting story; but it still has no scientific merit. Go from leg pain muscle testing to Femoral nerve.